What is the value of one life in an interstellar war that has already claimed millions? And if that single life doesn’t matter, are any others worth saving? 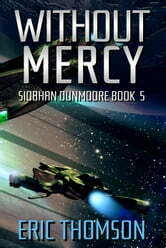 A distress signal draws Siobhan Dunmoore’s Q-ship Iolanthe, a battlecruiser disguised as a bulk freighter, away from her devastatingly successful hunt through Shrehari occupied space and plunges Dunmoore into a dark, merciless universe of competing government organizations, undercover warfare, and organized crime on a galactic scale. Along the way, she crosses paths with an old foe and an uncertain ally as she and her crew race against time and determined opposition to rescue innocent civilians condemned merely because they were in the wrong place at the wrong moment. Powerful forces within the Commonwealth would call a handful of lives collateral damage in humanity’s existential struggle against the Shrehari Empire. But Dunmoore won’t accept that they aren’t worth saving even if it puts her at cross-purposes with her new commanding officer and the Commonwealth’s fearsome security bureau. After all, her oath to serve and defend has no limitations and no expiry date. Another excellent addition to the series. Missed a bit of character depth more evident in earlier ones but still an enjoyable read. Il personaggio del capitano Dunmore è ben costruito ma dopo il quarto titolo della serie, mi era sembrato che si fosse arrivato ad un momento di flessione, quel senso di già letto e quasi scontato. Invece questo libro ha ridato freschezza alla serie. Molto avvincente. Attendo di leggere il prossimo con buone aspettative. Another good book, and the ending suggests the main story might be rekindled in book 6. This is a storyline that could potentially run to many more episodes and begin to get tedious. I hope Thomson will refocus and finish before we get to double digits. Good addition to the series. Dunmoore and the crew of Iolanthe get to play heroes even though various factions try to stop them. Characters are true and keep evolving. #6 should be good!